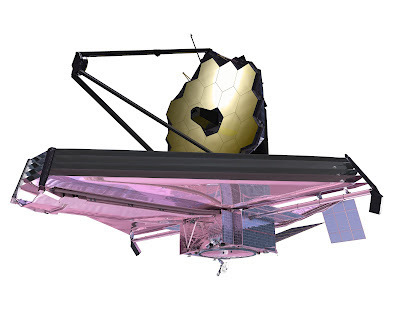 The James Webb Space Telescope (JWST or simply Webb) is a large, infrared-optimized space telescope. Designed to replace the Hubble Space telescope, Webb is projected to launch into space in 2018. Its mission is to find the first galaxies that formed when the universe was young. It will try to connect the progress of the Big Bang and how the Milky Way Galaxy came into being. Webb will peer through dusty clouds to see stars forming planetary systems, connecting the Milky Way to the Solar System. Webb's instruments will be designed to work primarily in the infrared range of the electromagnetic spectrum, with some capability in the visible range. The space telescope will have a large mirror, 6.5 meters (21.3 feet) in diameter and a sunshield the size of a tennis court. Both the mirror and sunshade won't fit onto the rocket fully open, so both will fold up and open once Webb is in outer space. Webb will reside in an orbit about 1.5 million km (1 million miles) from the Earth.